The staff here are all riders, so the support doesn’t stop at the shop – we will see you on the road or out on the trail! We aim to encourage people to take up cycling as a lifestyle choice. Mitchell Cycles was founded by Dave Mitchell in 1953. The original store was in Liardet street. Since then the store has seen several changes in ownership and locality before shifiting to the current location in 2010. Dave, the founder, was an avid racing cyclist. While it was a family orientated shop he catered for the more competitive rider as well. These principles still hold true in the store today. Blair has been in the trade 25 years, but cycling for 35. 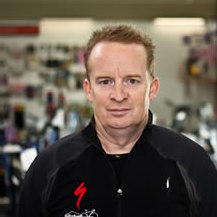 As a racing cyclist Blair was sponsored by Mitchell cycles and represented New Zealand for a period of ten years. He has competed all around the world and won a silver medal at the 1986 Commonwealth Games in Edinburgh. Upon retiring in 1989 Blair took on work at Mitchell Cycles in a mechanic/sales position. 6 Years ago Blair and Robyn bought the business and have steadily built it up to the shop it is today. Blair now competes in Triathlons with a preference to Ironman races and has currently done 11 Ironman races, 5 of which were overseas, including one World Championship race in Kona, Hawaii. Blair also has been a race mechanic for Ironman races. With the help of the staff here Blair is now trying his hand at Mountain Biking. Blair has also recently trained up in Body Geometry Bike Fitting and is currently one of two Master BG Fit technicians in New Zealand. Born and raised in the Taranaki, but has recently returned from a 14 year stint in Auckland. 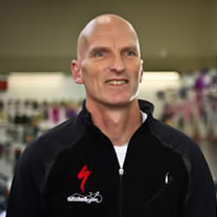 Glen has 8 years experience in bike shops in a sales position, but has been working in retail since ’86. Rides mountain bikes and commutes to work each day as well has chasing his two young kids along the foreshore on the weekends.